You are not alone; there are countless people just like you who would like this question answered, so I’m going to delve into this subject for you. I know that not everyone is the same, or has the same tastes (or the same budgets!). Imagine what a boring world it would be if we were all identical. Having said this, a weighted blanket could very likely be the one solution many of us end up requiring, it could be your saving grace for a variety of reasons, which we’ll explore in more detail in a moment. In my case it was insomnia and I have searched high and low for a cure, tried various medications, aromatheraphy, music, lotions and other weird remedies to no avail… You might know what a terribly tedious journey it could be. You also recognize that doctors, medication, supplements, alternative treatments and so on, could not be as effective, or in the long run they can cost a lot of money. Then, thankfully, I discovered weighted blankets. A purchase I only had to make once (I hope it lasts for quite a while as I’m taking good care of it) and that won’t break the bank. To me this is quite a deal, as with the numerous benefits weighted blankets provide, anyone could not only save money in the long run, but get some well-deserved rest too. What if you don’t suffer from insomnia or any health conditions you ask? That’s no problem at all, weighted blankets can be used by anyone, even if you’re simply seeking a comfort aid. There really is no reason for not using it, besides the price maybe. So, are Weighted Blankets the Right Choice for You? 1 So, are Weighted Blankets the Right Choice for You? 2.24 Is a Weighted Blanket All It’s Cracked Up to Be? First of all, I’m going to assume that like me, you like to know all the facts and details before you can make an educated decision. Knowledge is power, and most certainly prevents you from making the wrong choices and silly mistakes. I remember the time when I was considering getting my own weighted blanket, I had so many questions, so many concerns, but I can tell you that it was one of the best purchases I have ever made. Using a weighted blanket applies weight on top of your whole body (this is called deep-touch pressure therapy), and aids in releasing endorphins. Because of this, it helps decrease the production of night-time cortisol which is a hormone that controls the ‘fight-or-flight’ response of our body, thereby putting us under stress. Deep touch therapy focuses on pressure points in your body that release melatonin to help you sleep, and serotonin, which helps improve your mood, and relieve symptoms of conditions like depression and anxiety, and can even have a pain-easing effect on the body among other things. Further studies on deep touch pressure therapy have shown that it does work1. This calming effect this hefty blanket produces in itself, makes it worthwhile. Like I said before, I know you’re wondering if a weighted blanket is right for you, so I’ll explore a few reasons that will help you make this decision. As mentioned above, sometimes our cortisol levels get quite high. Serotonin released after using weighted blankets on a regular basis will help your body control the excess of this annoying hormone. No one should have to go through losing 20 minutes of their lives every night staring at the ceiling or counting sheep. The relaxing effect of heavy blankets will help you fall asleep faster. Some people are just like that. I mean, everyone loves hugs, but some of us can find a way to have a permanent hug in heavy blankets. This is even better for people who crave tactile stimulation, but don’t like receiving it from actual people, like some SPDers (people with sensory processing disorder), for example. I know I’m not the only one who feels like every morning when I wake up under my heavy blanket, I just feel ready to get up. This happens to me many more times than when I didn’t have it, and I’ve read about people feeling the same way, so that’s not a coincidence. This is a very common one, we go by so stressed out by everything, every little thing we go through during the day constantly fills our minds, and all of this has a staggering way of showing up right when we’re about to sleep. You have to give it a try to understand what I mean: lay under the weighted blanket for 5 minutes, your body will fill comfortable, release endorphins, and (hopefully) it’ll be easier to let go of those things to sleep better. Our ADHD peers would really appreciate these blankets. Even though they aren’t a magical cure, there are lots of cases when we can’t really focus on anything because we didn’t rest well at night. And heavy blankets can be a great way to aid with that. I’m gonna say it: weighted blankets make for great snuggling with your partner, there’s something about being stuck together under a lot of weight, that just feels great. Even if you don’t have your partner there, it’ll make you feel less lonely. I can’t really explain it better, but lots of people say the same thing, so I’m not the only one who has experienced this. Some people claim to feel much better under the blanket because it provides a sense of security, especially at night. When we can feel so vulnerable. Having weight on top of us makes us feel cared for and safe. To all of the lifters out there, I know you don’t have problems to sleep after a day of hard workout (probably) but sometimes the training is a bit too rough on our bodies. That’s the moment when weighted blankets make their magic appearance to save the day. Yep, it turns out that having the right amount of weight on top of you during the night can sometimes regulate the circulatory system and help alleviate the pain produced by muscle inflammation after working out. One of the main benefits of weighted blankets is that they are meant to keep you sleeping. Think making your dreams come true is hard? Just try waking up in the middle of the night while using your blanket! In 5 months I can’t really remember if I’ve ever woken up in the middle of the night while using it, even though it was a common thing in the past for me. There’s something about that just knocks you down and makes you sleep until you actually want to wake up. REM sleep is the deepest stage of sleep, the stage in which we dream. It’s also when our body gets the best rest, and some people have a hard time reaching it because their quality of sleep isn’t good enough. Another use people have found for these products is relieving the pain caused by fibromyalgia and other chronic pain diseases, and by what I’ve seen, some people have gotten great results. Bed not comfortable enough? Your sheets’ fabric doesn’t really feel good? Well, most weighted blanket manufacturers really take care of their products. And I can assure you that weighted blankets are one of the best feeling-duvet-like articles you’ll find, and the fabrics used always feel amazing. If you want to be more comfortable while sleeping, and like pampering yourself, they are for you. Even though there’s no easy way of diagnosing a headache, most of them come from a single source: blood pressure. Heavy blankets can trigger the release of dopamine and serotonin, and as said before, the increase of these two hormones in the bloodstream can regulate blood pressure, and make feel good again. I’ve done plenty of research on the subject of weighted blankets for anxiety and ADHD, and it seems like they are a great way of coping with the symptoms. Weighted therapy tools have been often used by occupational therapists to help relieve the symptoms of ASD patients; weighted blankets, vests or shoulder wraps, provide a calming effect that helps to stabilize the mood and calming the patients. This is like an automatic -you will love a weighted blanket- statement, people who like massages or acupressure, will probably like sleeping with weighted blankets, as the heavy contact over their skin an muscles provides a sensory stimulation they’re familiar with, and enjoy. Think of it as having a massage every night while you sleep! Weighted blankets have been proven a great tool for the elderly, especially those with dementia or Alzheimer, as getting a proper sleep is one of the main recommendations to alleviate the symptoms of these and other related conditions. I know, medication has the big benefit of being actually proved to work. But hey I also know I’m not the only one that thinks that medication shouldn’t the only way to deal with sleep issues. I don’t personally like medicating myself unless it’s really needed. So yeah, even though weighted blankets provide a “kind of subjective” healing, studies have been conducted where it shows that they can actually help most people2. It has been shown that comfort rooms are a great way of improving focus in patients in psychiatric units3 where serious studies have been conducted. And some occupational therapists have included weighted blankets in kids who don’t behave well in the classroom with good results. Another study actually showed that another form of deep touch pressure therapy, weighted vests, could improve in-seat behavior and task completion speed in ADHD students4. Some bodies can be overwhelmed by this kind of activities, especially for people who are just starting to practice them and aren’t that experienced. Laying under distributed weight can be a nice way of comforting the body and regulating the sensory equilibrium after such activities. If you -or anyone you care about- become a sleepwalker during the night, using a weighted quilt might just put a stop to it. The weight of the heavy blanket will decrease the ability to move around or get up out of bed when you’re in a sleep or semi-sleep state. Yes, you read that one correctly, using a weighted blanket is ultimately advantageous for your pets too. They can use it on their own (considering the right size and weight of course), or if they share your sheets. 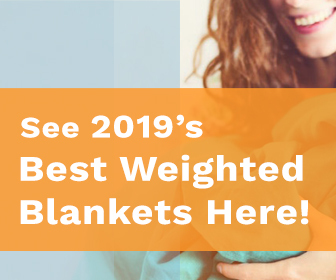 And there you have it, I’m sure that after exploring this list, if you found yourself thinking “well, that list totally fits me” you’ll conclude that this type of blanket absolutely is a great addition to your household. You shouldn’t waste another night without one. Is a Weighted Blanket All It’s Cracked Up to Be? I don’t have to tell you how horrible it is to not sleep well. Your body does not have the opportunity to rejuvenate and regenerate itself as needed, and several unhealthy conditions can be the result of a lack of sleep. For me it’s usually a combination of getting grumpy and super irritated, have zero patience, and for some odd reason want to eat the world when I don’t get enough rest. Using a heavy blanket has thankfully solved this problem for the most part. If you really want to know if a weighted blanket is right for you, but you’re not ready to take the risk spending the money, read this article about ways to try weighted therapy, without having to buy one. Also seeing all the other great health advantages I’ve touched on today as well as the materials it’s made of and the fact that you’ll probably only need to buy one in a generation, (unless your dog eats it or your mischievous two-year-old cuts it up), it absolutely is a sensible investment in your well-being. Therefore, my final impression of a heavy blanket is that there really is no reason you shouldn’t get one. If you’re convinced, it would help you a lot to read more about the things you need to watch out for when buying a weighted blanket here. Also, here you have my recommended weighted blanket manufacturers, if you want to see which ones are the best, click here.